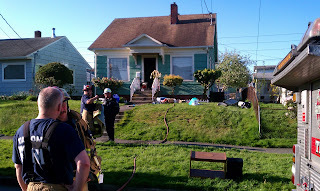 Narrative: At 6:46 a.m. seven companies of Tacoma Firefighters were dispatched to a reported residential house fire. The first arriving engine company found smoke pouring from the front door of the 816 square foot 1&1/2 story residence. Crews attacked the fire with hand lines, conducted primary search and rescue and ventilated the smoke from the structure. All of the occupants escaped safely, there were no injuries to report and the Red Cross is providing assistance for the 3 people displaced by the fire. UPDATE: The cause of the fire was an unattended candle, resulting in an estimated $60,000 damage to the building and its contents.